The Cherry Bomb ignites the palette with and enticing blend of cherry and black currant extracts, mellowed by a creamy vanilla. These flavors are combined uniquely with Grade-A Cuban seed tobaccos to create an unforgettable aroma that tantalizes the senses. A sweet enticing blend of cherry and black currant extracts, mellowed by a creamy vanilla. Perfectly sized for 30-40 minutes of smoking pleasure. A sweet enticing blend of cherry and black currant extracts, mellowed by a creamy vanilla. Not too long, not too fat! A favorite among the lady smokers. A sweet enticing blend of cherry and black currant extracts, mellowed by a creamy vanilla. Perfectly sized for 10-20 minutes of smoking pleasure. Each tin contains 10 cigars. A sweet enticing blend of cherry and black currant extracts, mellowed by a creamy vanilla. Sweet cherry with a splash of the exclusive creamy Heavenly vanilla flavor creates a flavor explosion! One of the best Cherry cigars available on the market. Sweet and aromatic. 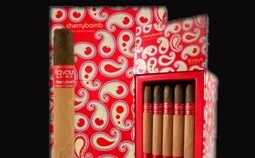 Miniature flavored cigars packaged in packs of 10 cigars. Each carton contains 10 packs of 10 for a total of 100 mini flavored cigars. Medium bodied smoke with lots of flavor. Aromatic and sweet!